Before I got the flat tire, I visited St. John’s Cemetery in Queens, New York. The staff there was incredibly helpful in assisting me with finding the final resting places of the many ancestors of me and my fiancé that are buried there. In fact, there were only two people that I needed them to look up because I came in already knowing the exact spots of where many of our ancestors were. This was thanks to their online tool called Locate A Loved One. This search engine offered by Catholic Cemeteries gives you the exact location of where your ancestor is buried. It covers St. John’s Cemetery, Mount St. Mary in Flushing, Holy Cross Cemetery in Brooklyn, and St. Charles Cemetery in Farmingdale. Not all records have been uploaded to the website though. So, don’t assume that just because one of your ancestors doesn’t appear in the search results that they aren’t actually buried there. The best way to confirm where your ancestor is buried is to obtain their death certificate. 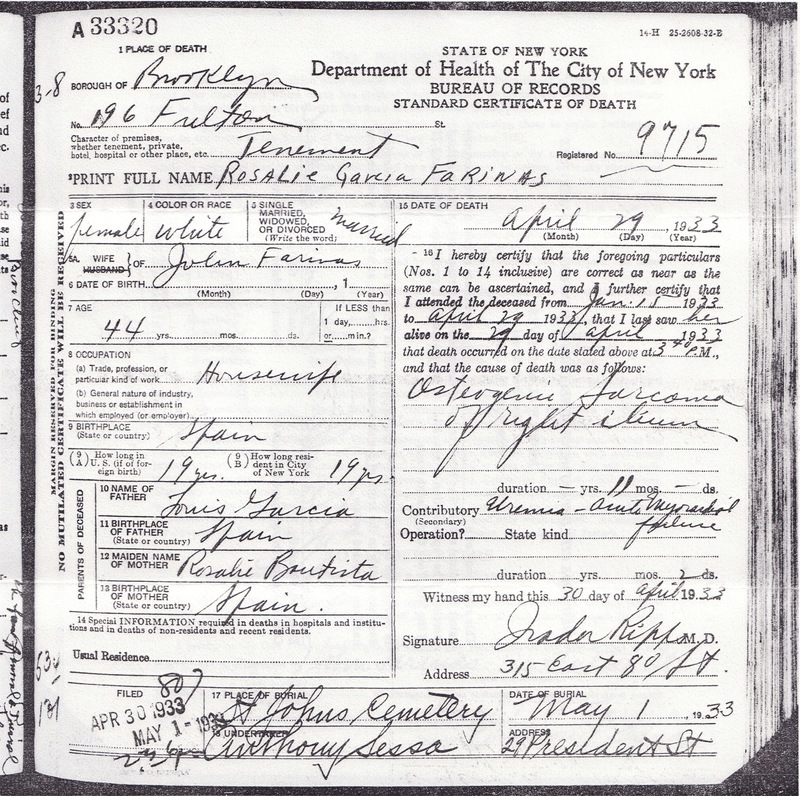 For those that died in New York City before 1949, you can purchase their death certificate online from the New York City Municipal Archives. Some people opt to actually visit the archives and take photos of the records in order to save some money. However, if you do not have the capability to travel to New York City, then you will have to pay the $15 fee to obtain a copy of each record. I always make my records available on Ancestry.com because to me it just doesn’t make sense to make people continue paying for the same information. I wish New York State made their vital records publicly available but for now hopefully you have a cousin out there that has made it available instead. 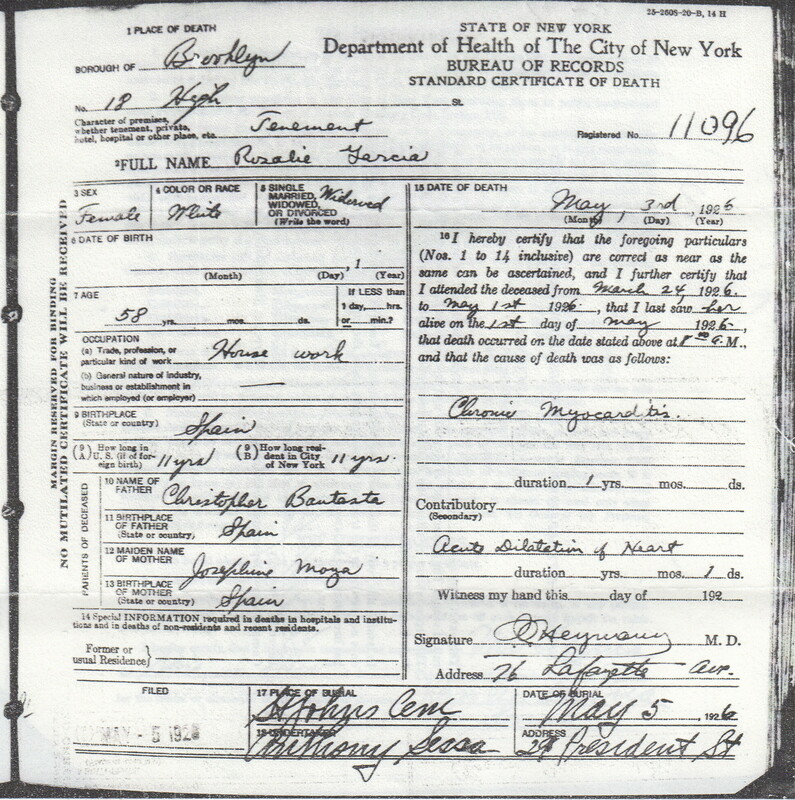 If you have not a clue where to begin to locate a death record in New York City, the NYC Death Index provided by the Italian Genealogical Group is a good place to start. I have had a lot of success using this tool and the ancestors I am about to highlight were all first found using this great database. The first ancestor I received information on at St. John’s Cemetery was Rosalia Fariñas (née Garcia), my great-great grandmother. 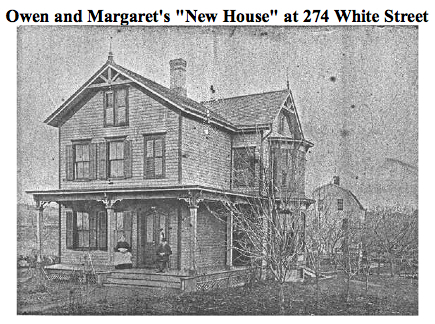 I actually wrote about her before as part of the #52Ancestors challenge in 2014. I always wondered why she wasn’t buried with her husband, Juan Fariñas, who is buried at St. Charles Cemetery in Farmingdale. When I asked my grandmother about it, she stated that her grandfather Juan was supposed to be buried with her but a little boy in the family had passed away and was buried at the plot in St. John’s. I suppose there was such a large gap between the two of them passing away (33 years) that the plot in St. John’s had filled up and the choice was made by Juan to get another plot in a Long Island cemetery instead. Anyways, I was intrigued to see who these other people were that were also buried with my great-great grandmother. 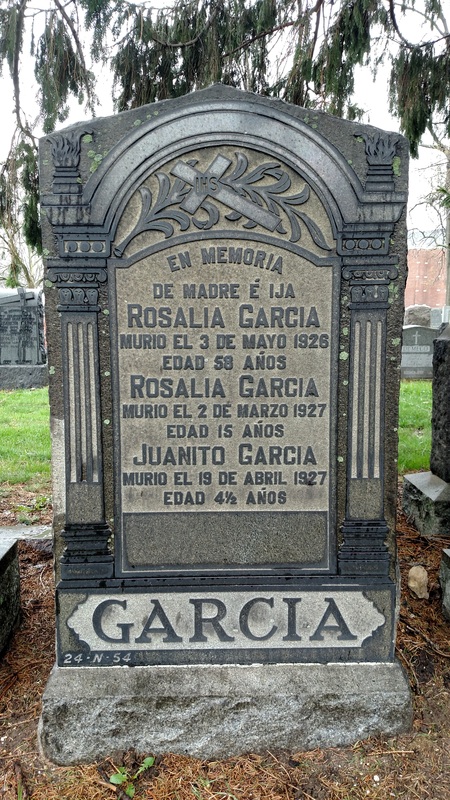 The other ancestor I received information on at St. John’s Cemetery was Rosalia’s mother, my 3x great-grandmother, Rosalia Garcia (née Bautista). 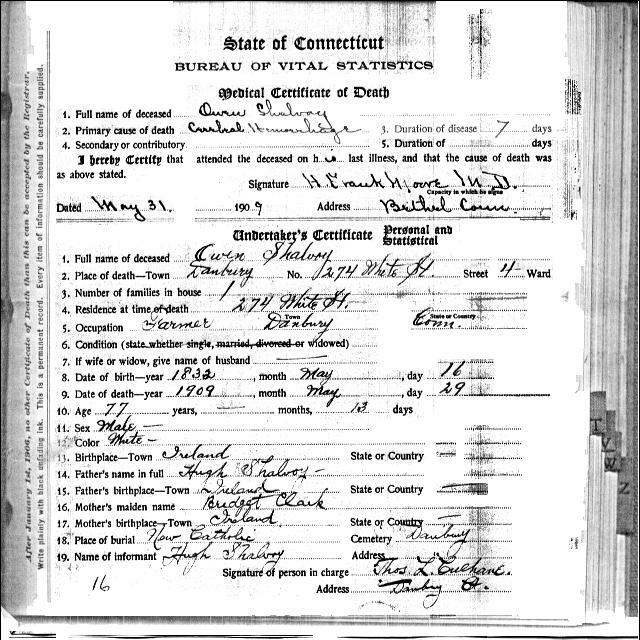 At the bottom of Rosalia’s death certificate, you can see that her place of burial is St. John’s Cemetery. As I had figured, they were buried in the same plot together. Knowing it is standard for many plots to just hold 3 people, I figured it was the two Rosalias and the “little boy” – perhaps a kid brother of my great-grandmother that our family never knew about. What I found was interesting and beautiful. What I was looking at was one of the most beautiful headstones that I had ever seen – certainly something more than what I thought my Spanish immigrant ancestors could afford. The stone was absolutely stunning and quite frankly looked brand new. No doubt that this is the type of stone that will last hundreds of years without needing any type of restoration. Another striking thing I noticed was the age of the second Rosalia. Two Rosalias were there just as I had been told, and the first one matched the death date of my 3x great-grandmother. 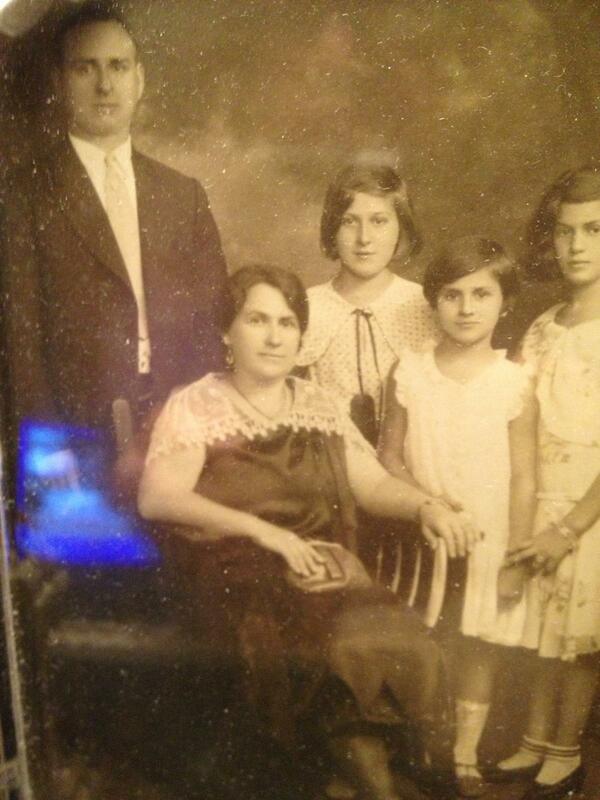 However, my 2x great-grandmother had died in 1933 at the age of 42. She did not die in 1927 and she certainly was not 15 years old at the age of her death. Could this be a mistake made by a mason? Highly doubtful – not with that kind of work. Could the office have made a mistake and my 2x great-grandmother is buried elsewhere? That seemed to be more plausible. I called the office back. They said, “No, she is there.” Turns out there weren’t just two Rosalias there. There were three. I had never heard of this Rosalia. I had also realized that someone had failed to make sure that my 2x great-grandmother’s name was added to the stone. Through this website, I hope to be able to be that person that finally gets her name up there. So, who was this other Rosalia? And who was Juanito? Turned out my grandmother was right. There was a little boy buried there (died at just 4 years of age). What happened to them? How were they related to me? Who were their parents? They seemed to be too young to be the children of my 3x great grandmother and to my knowledge they weren’t my 2x great-grandmother’s kids. So, who were they? So many questions…Questions that never would have been asked had I not taken the time to visit them. My hypothesis was that they were the children of Rosalia’s brother Louis (who I mentioned in my last post about her). Where was Louis buried though? Why weren’t they with their parents? All things I had to look into. Well, I did and I am happy to share what I have found…in my next post. #52Ancestors – Week 6 – William Peter Achnitz Sr.
William Peter Achnitz – That is my name. I carry that name with a tremendous amount of pride – the name that was given to my grandfather, William Peter Achnitz Sr., who then gave that name to his son, William Peter Achnitz Jr., who then gave that name to me, William Peter Achnitz III. Now growing up, as one could imagine, got pretty hectic with three Billy’s in the house. There was of course “Grandpa” or “Dad” for my father and Aunt Tracy. There was “Dad” for me who was also “Uncle Billy” to my cousins. And of course me, who for me was just “Billy.” However, for my Grandmother, there was Billy the husband, Billy the son, and Billy the grandson. Who do you think ended up becoming known as Little Billy? Who can envision me raising my hand right now? It’s funny…Even to this day, my cousins refer to me as Little Billy. They don’t address me as Little Billy but when referring to me in a conversation with somebody else in the family I have always been and always will be known as Little Billy. As a kid, I hated this. I didn’t understand it because I was the oldest grandchild. In my mind, I should have been the last person to be called “Little” because everyone else was little to me. Reflecting back on it now though, I have come to embrace the name because after all it did effectively identify me as the Billy in question. I can remember many funny instances where people would say something shocking about a “Billy” and the response would always be “Not Little Billy, right?” as if I was this perfect, “little” human being incapable of doing any wrong. That reputation always provided for an extra shock though when the shocking news was indeed about me. Although I did not live with my grandfather like my cousins Paige and Shane, I did spend a great deal of time with him growing up. I hold so many dear memories close to my heart of the days that I spent visiting my grandparent’s 3-story townhome in Palm Harbor, Florida. To me, that house was like a castle. It was tremendous and I remember there were 3 entire floors to play hide-and-seek on. No chance of being bored in a house of that size! I remember also that it wasn’t a sweet victory unless those trips were capped with an overnight stay at Grandma and Grandpa’s as it was nearly inevitable for me to make the request to sleep over. Almost always I got my way and some of my fondest memories in life in general come from spending time with my grandparents in that townhome. 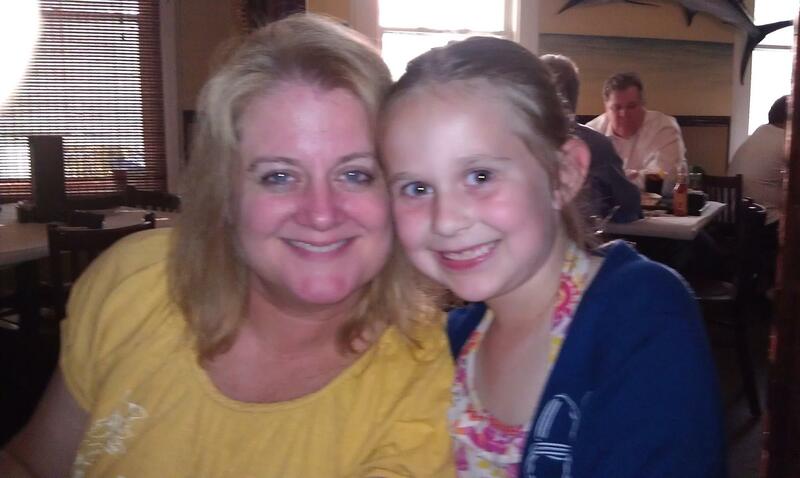 As the oldest grandchild, I remember watching everyone else enter into life. I remember watching my cousin Paige sleep in her bassinet when she was only an infant. I remember when just the two of us played together before our next playmate arrived. I remember touching my Aunt Tracy’s stomach and her explaining to me that my new cousin would soon be joining me and Paige because her tummy would no longer be his permanent place of residence. I remember that with Shane now in our lives, that I had a boy to play with, so often times Paige ended up being overruled because after all “Boys ruled, and girls drooled.” I remember that for whatever reason me, Paige, and Shane would always build these elaborate forts out of blankets, sheets, and towels with absolutely no objections from my grandmother or grandfather. I remember running across the street barefoot chanting “hot feet, hot feet, hot feet” in unison with my cousins before finally cooling them off in the neighborhood pool. This phrase was often echoed by my Grandpa too as he ran with us back and forth between the pool and the house. I can remember my grandfather teaching me how to swim. In fact, he taught every single one of his grandchildren how to swim. Quite distinctly, I can remember him teaching me how to plug my nose, bend my head back under the water, and come back up that way the water would get the hair out of my face. I still do that same exact motion every time I go into the water. I remember when my brother Zachary and sister Amber finally came along. I remember the 5 of us altogether on Christmas Eve where Santa would come to visit us each year, Santa meaning either Grandpa or my Dad. I remember every grandkid would get to open at least 1 Christmas present each on Christmas Eve. I remember all of the smiles that my Grandpa had when looking at any of his grandkids. I remember the pride he took in being a grandfather as he would brag about all of us to anybody that he came across. I remember his laughs and his jokes and all the smiles that those provided the 5 of us. I remember him coming to my football games, my baseball games, Paige’s softball games, Shane’s baseball games, Zachary’s baseball games, Zachary’s football games, Amber’s pageants. I remember how much he enjoyed going out to eat at a restaurant. No matter how great my grandmother cooked, I always felt like for him there was nothing better than taking his entire family out to a nice restaurant. I remember when my Grandpa owned a NASCAR collectible shop called Thundershoppes. I remember visiting and running around his store, admiring the insane amount of toy cars that were upon me. I remember always getting to pick out a race car from one of his display cases to take home with me. I remember rooting for Dale Earnhardt during the Daytona 500 just because that was his favorite driver. I remember how upset he and my father were when he died in that tragic car accident in 2001. I can remember how excited and happy they both were though when Dale Earnhardt Jr. won the Daytona 500 for the first time in 2004, and how emotional that moment was for the two of them. It was like their mutual love for NASCAR and their combined aficionado for another father-son team led to this incredible bonding experience that ultimately brought them closer together. I remember there were times that my grandfather didn’t get along very well with my Dad. I remember hearing the both of them talk about the differences they had with each other. I remember there was some harsh language being spit from both sides that I knew I would never want to repeat with my father. I remember that these moments were filled with passion. I remember my father would say this statement in a very emotional state of mind. I remember trying so hard to not laugh at the phrase “garbage man” that sometimes I just couldn’t help myself. I would blurt out laughing and you know what so would my Dad. My grandfather wasn’t a simple man. He lived a really rough life. And when I started getting into family history, I realized there wasn’t much for him to tell when it came to his father (my great-grandfather). My grandfather was born on February 26, 1940 in the Bronx. His father was John William Achnitz and his mother was Veronica Catherine Donnelly. He went to 4 different high schools, all at the same time. Literally, he wasn’t enrolled in any of them. He just went because he felt like it. So, suffice to say, he didn’t exactly walk away from the American education system with any real documentation that he was even part of it. He must have learned something in school though because if there is one quality that I know my grandfather had it was determination. That man knew how to make money. No matter what he was going to put a roof over your head and put food on your table. And whether it was by selling cars, furniture, or picture frames, that man at the end of the day was an entrepreneur. He also claims to have done some muscle work for an Italian organization that’s name shall not be mentioned. My grandfather also served this great country. He was a Green Beret Special Forces from 1962-1965 and he served in Panama as well. He was also a paratrooper and I’ll never forget the story he told me about throwing some guy out of a plane (hopefully he was wearing a parachute). My Grandpa was an awesome guy. And anybody that knew him would agree with me. He raised two kids and was an amazing grandfather to 5 kids. He loved my Grandmother and was actually the first man to marry his bride at St. Rose of Lima Church in Massapequa, New York. He impacted a lot of other kids as he coached my cousin Shane’s baseball team for a number of years and volunteered as an umpire at Oldsmar Little League. For a somewhat hard-nosed tough guy, he also probably loved our dogs more than anyone else in the family as I remember him cuddling with practically every dog we had ever owned. I remember right after my junior year in high school, my Grandpa started to get sick. I had come to learn that he was diagnosed with diabetes and like many other people with it was at risk to lose a limb. Luckily, only a few toes had to go and he never was unable to walk. I remember the pain that his pain brought to the rest of the family. Nobody wanted to see him like that. I remember how worried everybody got after each hospital visit. But like I said if there was one quality that I know my grandfather had it was determination. My grandfather was a survivor of 2 open-heart surgeries. One happened before I was born and I believe the other happened when I was really young. But I always remember being fascinated by the giant scar that ran down his chest where they cut him open. He exuded no shame. That man walked around without his shirt on more than any other man I know. As many would want to hide a scar like that, he proudly displayed it as if it were a reminder that he beat the odds – A reminder to him that he would live life to the fullest and live on yet another day. He did just that. He lived for us. He lived for his kids. He lived for his wife. He lived for his grandkids. He battled up until the very second he passed away on February 14, 2010 (just a couple weeks before his 70th birthday). There is no other memory that I treasure more than the times that I spent talking with him, sitting on the adjacent couch, during my breaks from college in New York. Those last few summer and winter vacations…there was nothing more that I wanted to do than just sit down and absorb as much wisdom as possible from this man that had lived one heck of a life. I could only aspire to one day be able to do the exact same thing with grandchildren of my own. I was in New York the day it happened. My father told me about how he was with him when he took his last breath. He said he was quiet for a minute, he took his last breath, and that was it. When I heard him tell me that, my mind immediately diverted to that phrase. My grandfather said his final prayer and then that was it. And as somebody who has struggled with their faith, which I’m sure is a struggle that a lot of people face, I know that he’s in a better place. I have faith because of my grandfather. Naturally, I took it really hard especially with not being able to be there when it happened. I almost felt like I didn’t get to say goodbye. I didn’t get that opportunity to have another final conversation with him. It was like I was kind of left wondering a lot of things. But I have faith because he’s come to me twice in dreams. The first time, he looked just like I remember him except he was in incredible shape. His shirt was off as usual and I could clearly see the scar on his chest, but the only way I can describe his stature is to compare it to a Greek God. He just looked incredibly healthy and incredibly in shape. However, his face looked just as I remember it. He didn’t say anything to me, but I remember he just stared and smiled. And I remember there was just this overwhelming sense that he was proud of me. The second time, which actually just happened a couple weeks ago, I was in one of those bad dreams where you’re being chased, like you’re running away from somebody trying to attack you. Somehow, the setting of the dream ends up in a restaurant. I’m no longer being chased by anybody, but the paranoia is still there, like the person who was chasing me was going to come into the restaurant to get me. I gave him a hug and sat down. And then I really don’t remember exactly what he said next, but it was something to the effect that he wishes he could eat with me more often. I woke up at that point and like after any dream, especially one that felt as real as that, you have a hard time remembering everything that was going on. Nevertheless, I was happy to have seen my grandfather again, even if it was just for a little bit. He gives me faith and I will always look forward to the times that he visits me. May we all one day eat again, certainly the restaurants in Heaven are much nicer. Owen Shalvoy is the 4th great-grandfather of my girlfriend Tiffany Church. He is also one of the first of her Irish ancestors to make the journey to America. 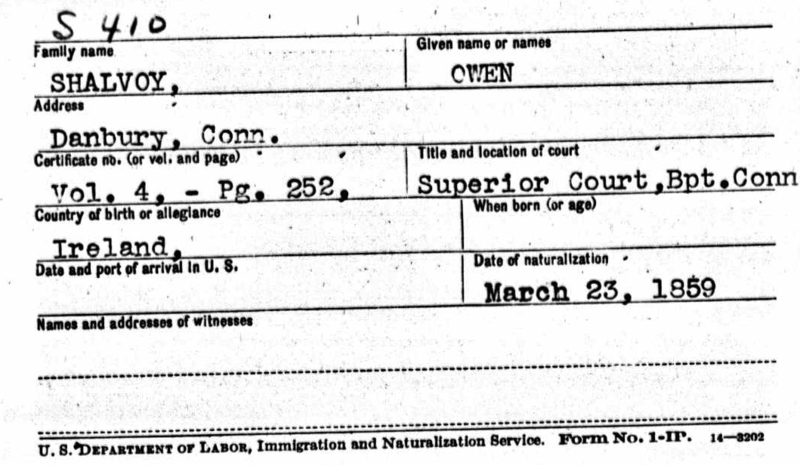 Born in 1819, Owen hails from the Village of Nobber in northern County Meath in Ireland. And like many other Irish, he and his family immigrated to America during the time of the Irish Potato Famine. Unlike all of my ancestors though, the information on my girlfriend’s ancestors (including Owen Shalvoy) is abundant and incredible. In fact, it turns out that a research group exists called The Shalvoy/Scollin Family Research Committee. And this group, all who descend from Owen Shalvoy, published a Family History Article entitled “A Short History of Our Shalvoy and Scollin Ancestors.” They also maintain a website with all of their genealogical research on their Shalvoy and Scollin ancestry. According to their research, Owen was baptized on October 6th, 1819 at the Nobber Catholic Church. And as you will see, this date conflicts with all of the ages provided on census records and even the age listed on his gravestone. It is theorized though that Owen actually thought he was much younger than he really was, 13 years younger to be exact. On Owen’s baptismal certificate, his parents are listed as being James Shalvoy and Bridget Clarke Shalvoy, while his sponsors are listed as being Owen Clarke and again Bridget Clarke Shalvoy. It is also believed that Owen and his family were much better off than the majority of their fellow Irish farmers (an Irish middle class if you will). In fact, leading up to their emigration, the Shalvoys leased a considerable amount of land and like many other Irish at the time, were farmers. 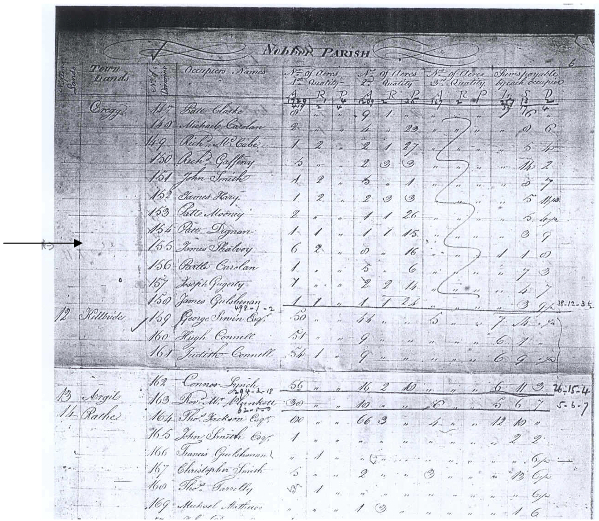 In fact, a Tithe Applotment Report conducted in northern County Meath in 1826, shows that there were two Shalvoys renting land in Cregg townland in Nobber Parish: (1) Thomas who held 23+ acres and (2) James, Owen’s father, who held 14½ acres. It can be safely assumed that Owen along with his many other siblings spent their childhood and young adult life working on their family farm. Eventually though, Owen, his mother and many of his siblings made the trip to America presumably to escape the devastating effects felt from the Great Famine. And based on the fact that they left at the tail end of the famine, it can be assumed that the Shalvoys were probably a bit wealthier than your typical Irish family since they were able to stick it out a little bit longer than the average Irish immigrant. This pattern seems to continue as they break free of the traditional mold of simply settling and looking for work in the port city in which they land. 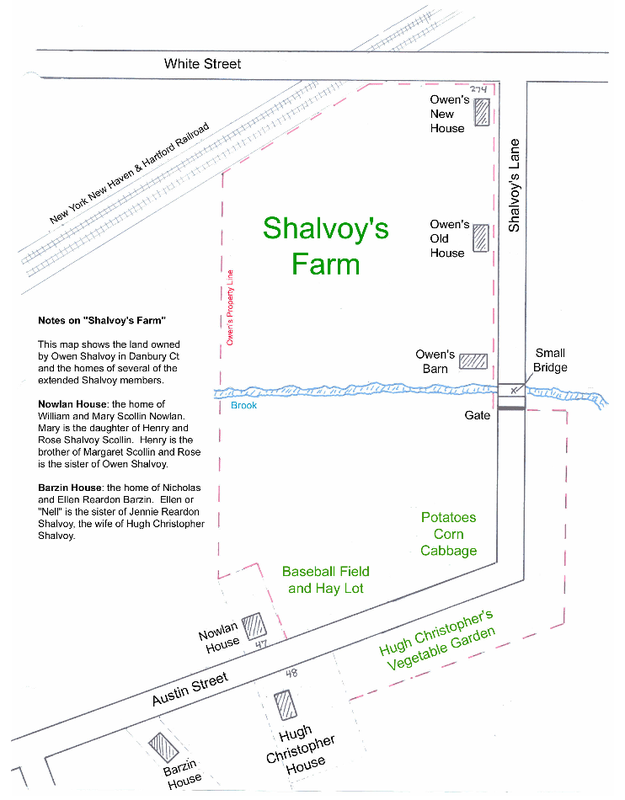 Interestingly enough, the Shalvoys made their way to Danbury, Connecticut and established a residence there becoming a fairly prominent family in the community. So, what made them decide to trek northward to Danbury instead of just settling in New York City like the majority of their Irish comrades? Well, based on the research performed by the committee, they believe that they must have known somebody in Danbury being that it was typical for Irish immigrants to only venture to new places when they knew someone already established in that city. Now, they don’t really have any idea of who that person was and thus cannot confirm why they chose to make the almost 70 mile journey. Nevertheless, the Shalvoys made it and established themselves in Danbury during the early 1850s. In Owen’s obituary, it is also stated that he immigrated to Danbury in May of 1851. After a few years in Danbury, Owen must have met the love of his life, a woman who he spent more than 50 years with because on February 28, 1854, he married Margaret Scollin. Funny thing though is that Owen’s sister Rose ended up getting married to Margaret’s brother Henry Scollin. So, either way these four were destined to be brother-and-sister-in-laws? Moving forward, between 1854 and 1866, Owen and Margaret had a total of 8 children: James Henry, Thomas Eugene, Mary Jane, Patrick Francis, Hugh (who died young), Hugh Christopher, Ann Elizabeth, and Joseph Clement (who also died young). He became an American citizen on March 23, 1859 and he first appears in census records in 1860. As you can see, Owen is listed as being a hatter, and according to the family history, it is said that he first worked as a farm laborer in Danbury, but then learned the trade of hatting. It offered the Irish immigrant and his children a way to earn enough money to support his family, to buy a house, to live in America. The story of the hatters of Danbury is the story of our Shalvoy family. By 1900, Owen had retired and was tending his own land, which by this time, had grown quite large. Clearly, he had done pretty well for himself being just another Irish immigrant. Personally, when I reflect on the idea of the American Dream, I see Owen Shalvoy. For me, a descendent of Irish immigrants, his story is inspiring as one day he was just yet another Irish immigrant, and the next he was an American landowner and success story. It is clear that the man was an extremely hard worker and cared very much about his family. He was a devoted husband and father as well as a prominent figure in the Danbury community and all of that is made abundantly clear in the way that he is described in his obituary. Unfortunately, Owen Shalvoy, like his obituary says, lost his wife only two months after their 50th Wedding Anniversary and then subsequently passed away about 5 years later on May 29, 1909 following a stroke. 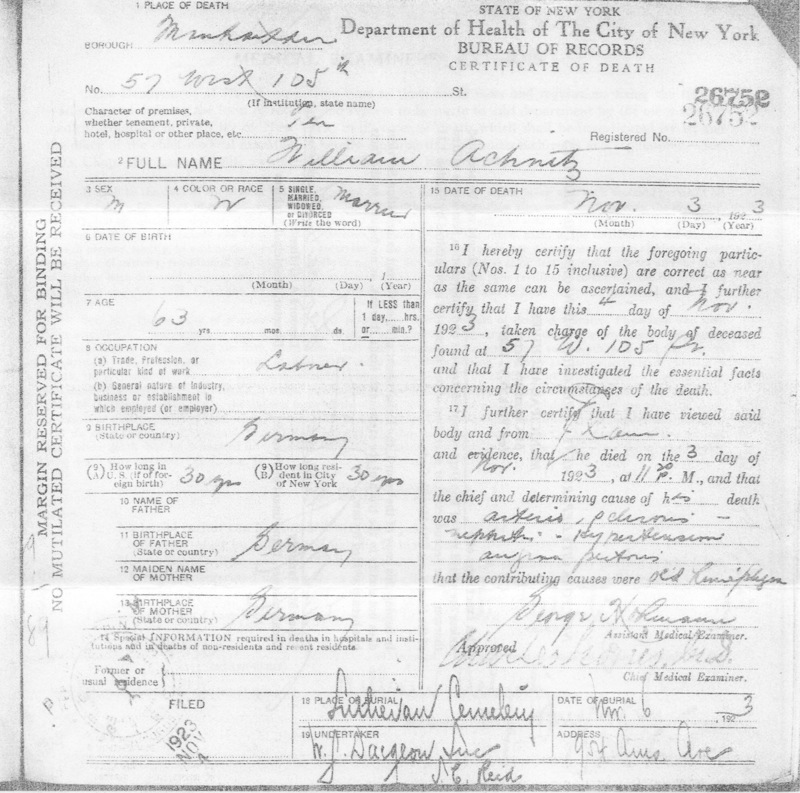 Now, note on his death certificate that his birth date is given as May 16, 1832. Although the month and day may be correct, it is highly doubtful that the year is right. We know that he was baptized in 1819, which would mean that Owen was probably around 90 years old at the time of his death, not 77. Nevertheless, Owen obviously lived a long, happy, and prosperous life, despite living through one of the toughest times in Ireland’s history whether he believed he was 77 or 90. And for me, he is a testament as to what can happen when you come to America and work really hard. Like I already said, one day just another Irish farmer immigrant, the next an American landowner and success story. Owen Shalvoy is exemplary of the American Dream and I’m glad others before me have already captured this great man’s story. It certainly made my job writing about him much, much easier! Rosalia Garcia Bautista is my 2nd great-grandmother and the mother of my great-grandmother Frances Fariñas, better known by my siblings and cousins as “Nanny.” Not much is known about her because unfortunately she passed away when my Nanny was only 12. However, I have done my best to piece together her life as much as possible from the research that I have done so far. According to her husband’s Petition For Naturalization, Rosalia Garcia Bautista was born on December 27, 1890 in Málaga, Spain (the birthplace of the famous Pablo Picasso) and she passed away in New York on April 29, 1933, at only 42 years of age. I have yet to confirm this birth date with the Province of Málaga, so if anyone knows as to how I can contact them to gather more information, please let me know. I do, however, know when she came to America from Spain. She actually traveled accompanied with her brother, Pedro Garcia Bautista on the S.S. Pannonia sailing from the Port of Gibraltar on September 16th, 1913. As you can see, she is listed as the sister of Pedro Garcia Bautista. Their nationality is Spanish and their last permanent residence was in La Linea, Spain, which is about an hour and a half away from Málaga. Her age is listed as 25, which would instead suggest that she was born in 1888 rather than in 1890. The name and address of their nearest relative that they both provide is of their mother Rosalia Bautista who lived on Calle San Cecilio in La Linea and their final destination is listed as Brooklyn, New York. Pedro is listed as being a laborer and I cannot make out what Rosalia is said to be. So, if anyone can make out what her “Occupation” is, please let me know. 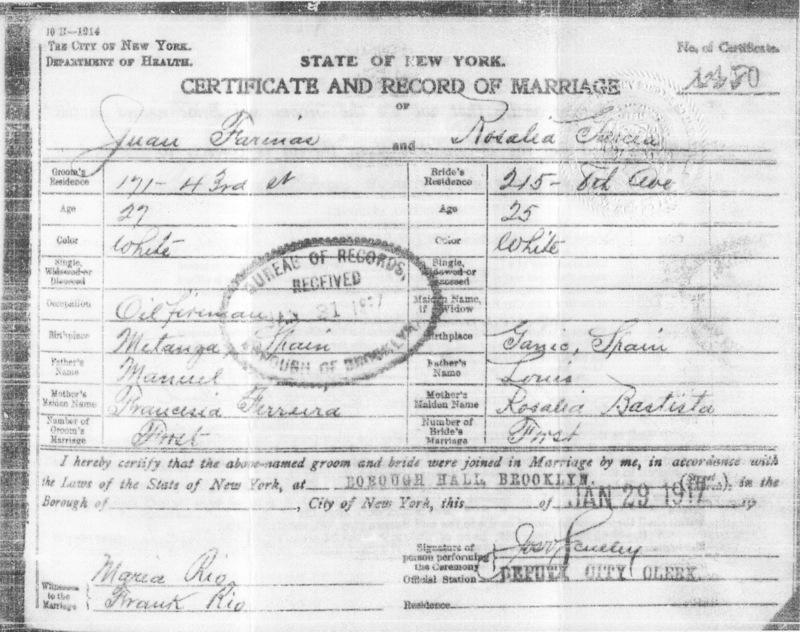 And although no one knows the story of how they met, I do know that it took just about 3 years of being in America for Rosalia Garcia to get married to my 2nd great-grandfather Juan Fariñas in Brooklyn, New York on January 29, 1917. As you can see, there is again another discrepancy in her age as she is now listed as being 25 again suggesting that she was born in 1892. She is also listed as being born in “Ganio, Spain” which to my knowledge does not exist. The closest spelling of a city in Spain that could be confused with that is Gandia, but that is much farther from Málaga, so I do not think that it is correct. I also know for a fact that Juan Fariñas was born in Bergondo (the place that he listed in his Petition For Naturalization), so I think that both of their birthplaces listed in their marriage certificate are incorrect. Her parents are also listed as Louis Garcia and Rosalia Bautista and there is plenty to suggest that this information is correct as Rosalia Bautista eventually made the journey to America as well. My grandmother remembers those names as well and she also remembers that in addition to her brother Pedro, Rosalia had another brother named Louis (potentially named after their father). There is no record of a Louis Garcia coming to America though with Rosalia Bautista and she is listed as widowed on the census records I found so I think that he must have died at some point in Spain. After they were married, Rosalia and Juan had three daughters back-to-back-to-back including my Nanny and her two older sisters Josephine and Louisa. Rosalia’s mother and brother also lived with them as shown in multiple census records at 18 High Street in Brooklyn, which to me indicates that they must have been a very close-knit family. Unfortunately though, Rosalia Garcia’s life was cut short due to bone cancer. She spent the last 4 months of her life in the hospital due to an osteogenic sarcoma of her right ilium (a cancerous tumor on her right hip) before her kidneys and heart failed. Although she left behind her husband and her 3 teenage girls, she must have had a huge impact on all of their lives because story has it that all 3 of her daughters never wanted their father to remarry. In fact, according to my grandmother and her cousin Rosalie, they supposedly coaxed him into never dating another woman by promising him that the 3 of them would take care of him for the rest of his life just as Rosalia would have as his wife. Even though my great-grandmother lost her mother at a very young age, I am confident that she must have been a great woman and mother to her because I spent the first 22 years of my life with my Nanny and she is one of the best women that I have ever known. If anyone else has any information on this ancestral line or Spanish ancestry in general, please let me know. I’d love to connect more with my Spanish roots. “Are you writing about yourself?” No, actually my name is William Peter Achnitz III. 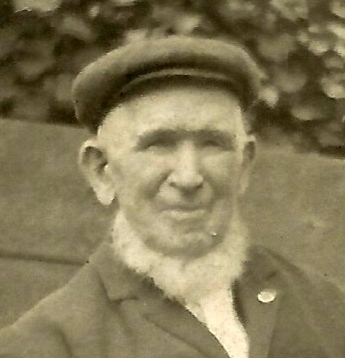 The person I am going to be writing about for Week 2 of the “52 Ancestors in 52 Weeks” Challenge is my 2nd great-grandfather, William Achnitz, or better known in Germany as Wilhelm Achnitz (I think?). Now, just to be clear my grandfather never knew either of his grandfathers since they had both passed away before he was born. So, everything he knew about them was from family stories passed on by his grandmothers and parents. Now, I have no idea whether or not there is any truth behind his legendary size (apparently he was 6’8’’), but what I do know is that there was a set of brothers in Germany with the last name Achnitz and two of them were Wilhelm and Jacob. The person I am related to though has always used the name William when in America but his suspected birth year coincidentally aligns more with Jacob. Did he maybe use his brother’s name when he made the journey across the Atlantic? Or did he just shave a couple of years off his life when asked how old he was to feel a little bit younger? All this information comes from baptismal records that I found on FamilySearch. However, I have not seen any of the FHL microfilm so I really just know what they have listed on their site. It would be nice if one day they made these images available online as I’m sure it would help a lot of people out in their research. It certainly would have helped me. Anyways, as per those records, they were all born in Nörvenich, which is a town in the Rhineland of Western Germany and their parents were listed as being Michael Achnitz and Caecilia Schumacher. However, William never uses either of those names on any of the documents that I have found to date in America. 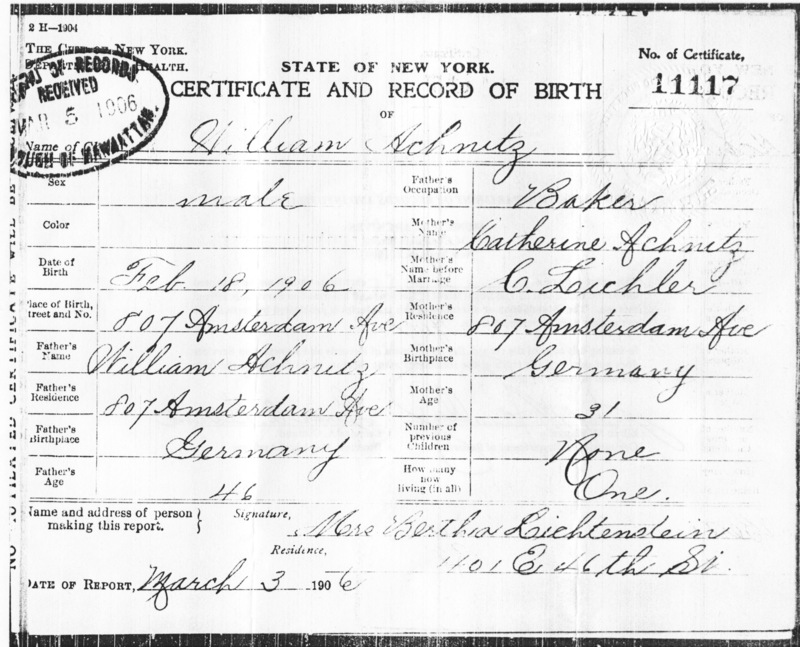 So, I don’t really know anything about his life while he was living in Germany, but at some point he must have gotten married because he came to New York City with his first wife Elsie on the ship Waesland on July 24, 1890. According to the United States Germans to America Index, he was listed as a merchant and his last place of residence was Cologne, Germany, which is about 40 minutes away from Nörvenich. Census records also align with this date making me feel pretty confident that they arrived in America in the year 1890. As could be expected, for an immigrant that just came to America at the turn of the 20th century, William Achnitz had to work and establish a career. It turns out that he moved around quite a bit during the 1890s. However, he managed to hold down a job as a baker. These were the only directories that I found him in before 1900 and he does not appear before 1891. Therefore, I’m pretty confident that his immigration record is accurate. This census lists him as having been married to Elsie for 10 years, meaning they would have gotten married in the same year that they came to America. We also see that William is actually 12 years older than Elsie rather than 6. This would have made Elsie only 19 when she married William. Perhaps, William was embarrassed by the fact that he was so much older than Elsie and stated a younger age on his immigration record. They are also listed as living at 807 Amsterdam Avenue, which happened to be the same address as the bakery. In fact, it turns out that William and Elsie owned the bakery that was below their residence. And this wasn’t just your run-of-the-mill local bakery that sold baked goods. It was actually an industrial-sized factory that produced baked goods. 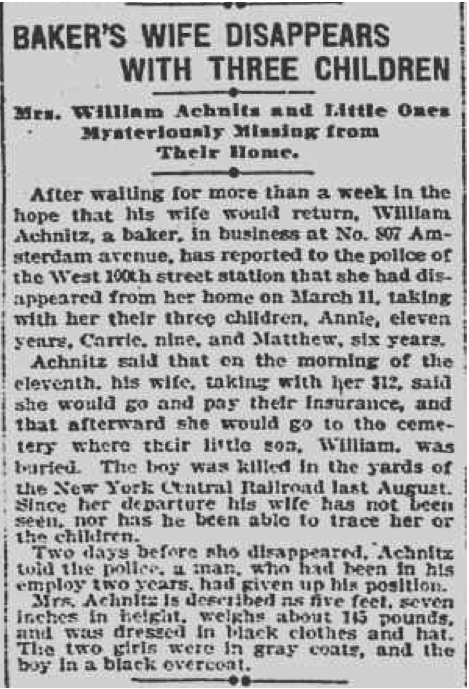 Turns out that William Achnitz had now lost his youngest child, his wife, and his remaining living children all within 1 year’s time. Records from Ancestry.com indicate that Elsie had left the country with Bernard Meiers as well as William’s three remaining children and eventually they made their way to Australia. Additionally, election rolls from Australia show that Bernard was a baker in Australia just like he had been for William in Manhattan. They remained in Australia for about 10 years before making their way back to Manhattan and it is unclear if William was ever aware of their return to New York City. 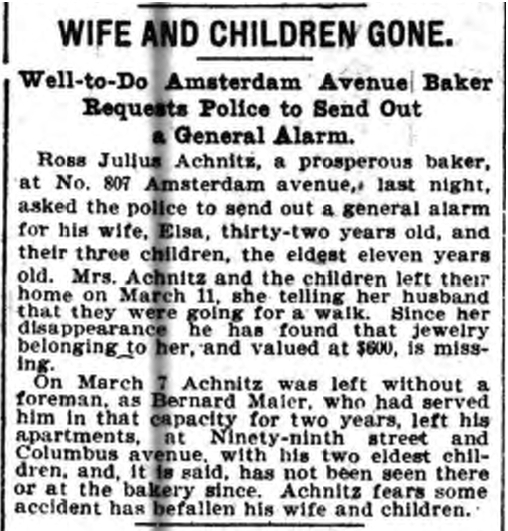 Now, I do not want to speculate on who was “right” and “wrong” in this scenario because for all I know William Achnitz could have been an abusive husband and father. Nevertheless, this man certainly experienced one tragedy after another. Also note that he is referenced under the name Ross Julius Achnitz in the second article. It seems unlikely that this was a mistake or typo on the part of the newspaper. And I really can’t think of any logical reason why he would use a completely different name. It just seems really odd to me and as you will continue to see none of the information he ever gives seems to align correctly with the original baptismal records I found on FamilySearch. A couple of years after Elsie’s disappearance, William eventually met my 2nd great-grandmother Catherine Dischler. They got married on May 9, 1905. 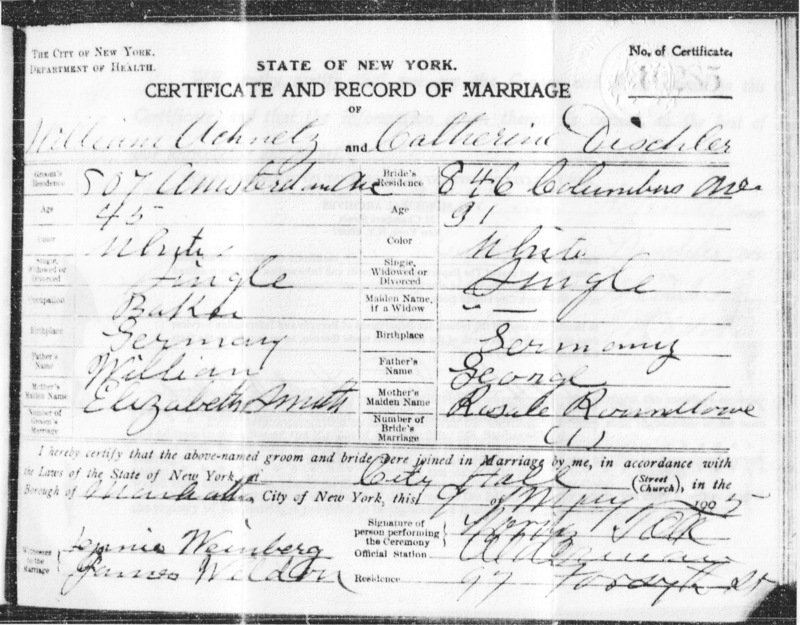 As you can see, on the marriage certificate of William Achnitz and Catherine Dischler, William lists his parents as William Achnitz and Elizabeth Smith. Also, his age of 45 in the year 1905 would suggest he was born in 1860 (the year Jacob was born). However, the parents on the baptismal records are again Michael Achnitz and Caecilia Schumacher. So, I can’t really say with confidence that either of these records are accurate because this man is consistently inconsistent with the information he provides about himself. Anyways, William Achnitz had what would be his last child and would end up being Catherine’s only son. Yes, another William. My great-grandfather was born with the name William Achnitz as well. However, he eventually started using the name John and William became his middle name. This is the only census I can find William and Catherine in together. Again, their is inconsistency in the information given as we know for a fact that William came to America in 1890, which would have meant he was only in America for 25 years rather than 30. Another thing that struck me as odd is that they moved and he was now a janitor. How does a well-known, prosperous baker become a janitor? 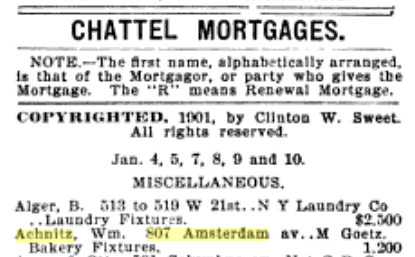 Based on these two listings, it seems likely that William Achnitz defaulted on the chattel mortgage and Mr. Goetz was transferred ownership of the bakery. It also seems as if he was allowed to continue working at the bakery for a few years, but then at some point he is listed as being a janitor and a superintendent. Unfortunately, William passed away on November 3, 1923 at 11:2opm at his residence of 57 105th Street due to multiple heart complications. He was listed as being 63 years of age. When I ordered this document, I was really hoping for some leads, but as you can see it is probably safe to say that my 2nd great-grandmother who was the respondent did not know the names of his parents – just the fact that they were obviously both born in Germany. He is buried at the same cemetery as his son William Achnitz, so my guess is that they are buried together. If anybody knows where Lutheran Cemetery is please let me know, because I have not been able to find anything listed at the 954 Amsterdam Avenue address. William Achnitz clearly lived a life filled with tragedy. He lost nearly everyone in his life and in a sense he lost even his livelihood when he lost his business. He also seems to have had a whole slew of health complications which culminated with his heart failing at the end of his life. Now, I’m not sure if any of this was of his own doing, but what is clear is that if none of these tragedies happened, I do not exist. And that is pretty profound to think. I stem from that one kid he had with his 2nd wife and it’s crazy to think that without his 1st wife leaving after the tragic death of their youngest child, my great-grandfather is never born. My grandfather is never born. My father is never born. And I am never born. People want to understand why genealogy is important. This is a case in point. A lot of things had to go right for us to be here and in the case of my 2nd great-grandfather William Achnitz, a lot of things had to go wrong. I have finally invested in an Ancestry.com membership. I have purchased numerous birth, marriage, and death certificates that revealed more information about my ancestors than I previously knew. And I even did an AncestryDNA kit with my mother this past Christmas. I love genealogy. And over the course of 2013, I grew an avid appreciation for it as it is the very thing that got us all to where we are at now. Oftentimes, when I was researching my family tree, I found myself reflecting on the thought that a lot of things had to go “right” and/or “wrong” for us all to even exist. It is exactly that thought that not only makes me appreciate genealogy, but life in general. I love my life and I strongly believe that knowing where you come from should play an important role in your life. It is for that reason that I have pressed on a little deeper than just researching my own family tree. Eventually, I want to become established in the field. 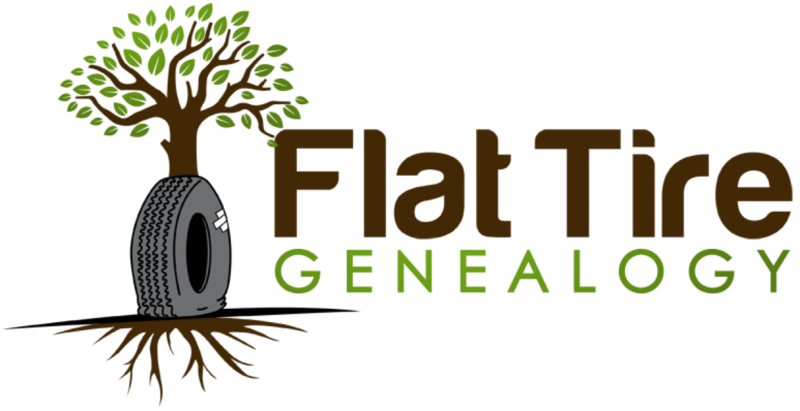 So, I have ended up exploring many genealogy blogs and thus far I have been very impressed by the level of proficiency that others seem to possess (i.e., writing their own research tips, publishing family history books, and aiding amateurs like myself). It is to this degree of proficiency that I hope I can one day reach, which is why I have decided to participate in the “52 Ancestors in 52 Weeks” challenge. A little late to the party I know, but what better way to hone my genealogy skills than to write about my ancestors for all of 2014? With that said, I must disclose in this introduction that I will not be doing this alone. Instead, I will be collaborating with my girlfriend of 6 years because I’m positive that I have not even reached the 52-Ancestor mark in my tree as of yet. Not to mention, being the genealogy enthusiast that I am, I have done the bulk of the research in her family tree and that’s okay because we have every intention to one day unite both our family trees. So, between the two of us, we will certainly reach the 52-Ancestor mark, particularly because her tree is much more “known” than mine. Unlike many other people, I come from a fairly unique situation. I really only know the ancestors on my father’s side and none of them have deep American roots therefore researching them has proven to be more difficult than I would have preferred. On my mother’s side, I know absolutely nothing. So, for my first ancestor, I give you my mother. My mother is Annmary Esposito. She was born on May 9, 1966 in Massapequa, New York and was adopted by my amazing grandparents Ralph Peter Esposito and Antoinette Rende, both who passed away when I was in middle school. Although they were not related to me by blood, they gave me all the experiences that a grandson could have hoped to experience with their grandparents and I will always remember them as such. They were two very amazing people and I know my mother was more than grateful to have been raised by such outstanding parents. My mother though has no idea who her biological parents are and New York State has sealed the record. In addition, my grandparents didn’t really like to talk about it and over the years my mother has heard a couple of conflicting stories regarding the heritage of her biological parents. On the handful of occasions that she did get to talk about it with her parents, she was told that her biological mother was a teenager at the time of her birth of English descent and the father was a “foreigner” of Greek descent. However, about 5 years ago my Grandfather’s younger brother told my mother that her biological mother was of Swedish descent. So, we are both hoping that the DNA results will shed some light on these accounts to see if there is any truth behind any of them. Although Italian at heart, my mother knew deep down that she could be anything, which is why we are very much looking forward to our AncestryDNA results. I know my mother would like to know at the very least her heritage and through our many conversations I know that she would be open to meeting either of her biological parents. After all, there is a good possibility that one if not both of them could still be alive today. Perhaps, one of them has even done the AncestryDNA test as well. I guess we’ll find out soon enough. 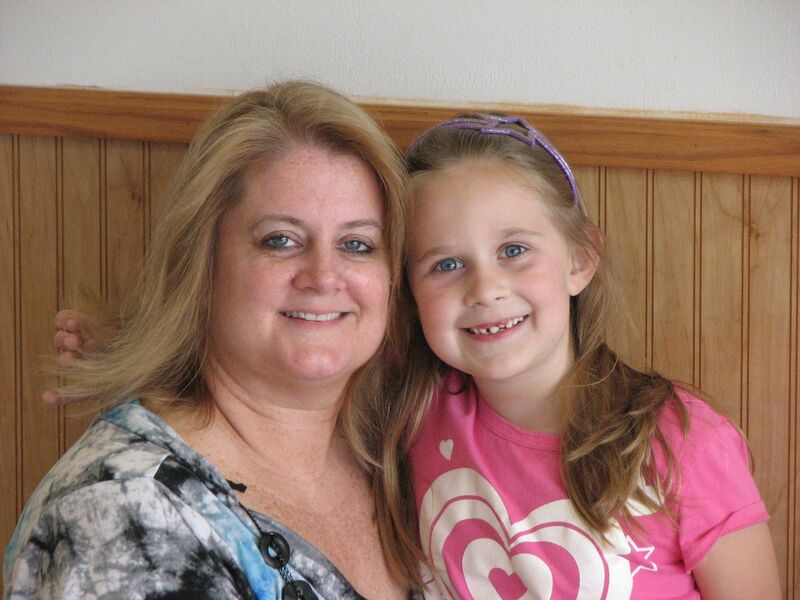 In the meantime though, my mother works full-time as a Senior Data Analyst for the Data Quality and Database Marketing Solutions company DataMentors and works overtime as a full-time mother for my sister Ashley, who happens to be 17 years younger than me. She enjoys cooking, working out with her HEAT High Energy Athletic Training group, watching Lifetime Channel movies, and of course being a mother. My mother is 50% of who I am and no matter what we find out I am proud to always know that my descendants will know exactly who my mother is – And that is an amazing, dedicated, hard-working mother who loves her kids with all of her heart.